Jeremiah knew of the deep seated grief that can come over a nation as he saw the slain of his people across the land. We too today can feel the sorrow of the innocent people taken by those who have no regard for God as they move through the earth from one evil to another. (Jeremiah 9:16). I will scatter them also among the heathen, whom neither they nor their fathers have known: and I will send a sword after them, till I have consumed them. At times there is a need for a fasting in which we abstain from food and take to prayer as Jesus taught His disciples when they were unable to cast out a dumb and deaf spirit He replied it was only with prayer and fasting that spirit could be removed. (Mark 9:17-29), but an evil of another sort has taken over the land where organizations such as Isis is without warning able to set up bombs and wipe out many who are unaware of its evil tactics as we see our President offer help for the victimized we have nothing in place to retaliate and are no further ahead in solving this tragic dilemma. It is outrageous the modern day church stays silent to a very good answer scripture gives us of what our duty is in the land as Christians that will cause the moving of God Almighty across the land to restore and heal! We are to loose the bands of wickedness, to undo heavy burdens and let the oppressed go free. (Isaiah 58:5-14). Is it such a fast that I have chosen? a day for a man to afflict his soul? is it to bow down his head as a bulrush, and to spread sackcloth and ashes under him? wilt thou call this a fast, and an acceptable day to the Lord? Is not this the fast that I have chosen? to loose the bands of wickedness, to undo the heavy burdens, and to let the oppressed go free, and that ye break every yoke? Is it not to deal thy bread to the hungry, and that thou bring the poor that are cast out to thy house? when thou seest the naked, that thou cover him; and that thou hide not thyself from thine own flesh?Then shall thy light break forth as the morning, and thine health shall spring forth speedily: and thy righteousness shall go before thee; the glory of the Lord shall be thy reward.Then shalt thou call, and the Lord shall answer; thou shalt cry, and he shall say, Here I am. If thou take away from the midst of thee the yoke, the putting forth of the finger, and speaking vanity; And if thou draw out thy soul to the hungry, and satisfy the afflicted soul; then shall thy light rise in obscurity, and thy darkness be as the noon day: And the Lord shall guide thee continually, and satisfy thy soul in drought, and make fat thy bones: and thou shalt be like a watered garden, and like a spring of water, whose waters fail not. And they that shall be of thee shall build the old waste places: thou shalt raise up the foundations of many generations; and thou shalt be called, The repairer of the breach, The restorer of paths to dwell in. If thou turn away thy foot from the sabbath, from doing thy pleasure on my holy day; and call the sabbath a delight, the holy of the Lord, honourable; and shalt honour him, not doing thine own ways, nor finding thine own pleasure, nor speaking thine own words: Then shalt thou delight thyself in the Lord; and I will cause thee to ride upon the high places of the earth, and feed thee with the heritage of Jacob thy father: for the mouth of the Lord hath spoken it. We have removed the greatest power of God by taking Him out of our schools as we unarm ourselves and our children with a word given us that is so powerful it will move mountains, Jesus is known as the word for this very reason! (John 1:1-5), for by it God crushes the enemy under our feet as He says He will make our enemies our footstool. His mighty power works through His people that believe in the one who holds all power in this world and the one to come! (Ephesians 1:18-23). The eyes of your understanding being enlightened; that ye may know what is the hope of his calling, and what the riches of the glory of his inheritance in the saints, And what is the exceeding greatness of his power to us-ward who believe, according to the working of his mighty power, Which he wrought in Christ, when he raised him from the dead, and set him at his own right hand in the heavenly places, Far above all principality, and power, and might, and dominion, and every name that is named, not only in this world, but also in that which is to come: And hath put all things under his feet, and gave him to be the head over all things to the church, Which is his body, the fulness of him that filleth all in all. 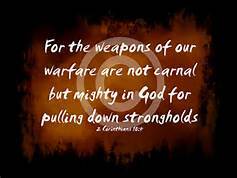 The power of God is in His SPOKEN WORD!, it is what will pull down the strong holds of any enemy. To stay silent is to be defeated………… Let’s put on the whole armour our Lord has provided us and be the Church He has established in the earth!!!!!! ( 2 Corinthians 10:3-6 ) For though we walk in the flesh, we do not war after the flesh: (For the weapons of our warfare are not carnal, but mighty through God to the pulling down of strong holds;)Casting down imaginations, and every high thing that exalteth itself against the knowledge of God, and bringing into captivity every thought to the obedience of Christ; And having in a readiness to revenge all disobedience, when your obedience is fulfilled……. (Ephesians 6:10-17).